Theories of Schizophrenia: Can They Work in Harmony? In this article, I use illustrations taken from the website of Bryan Charnley, an artist who suffered with schizophrenia and took his own life soon after these self-portraits were completed. 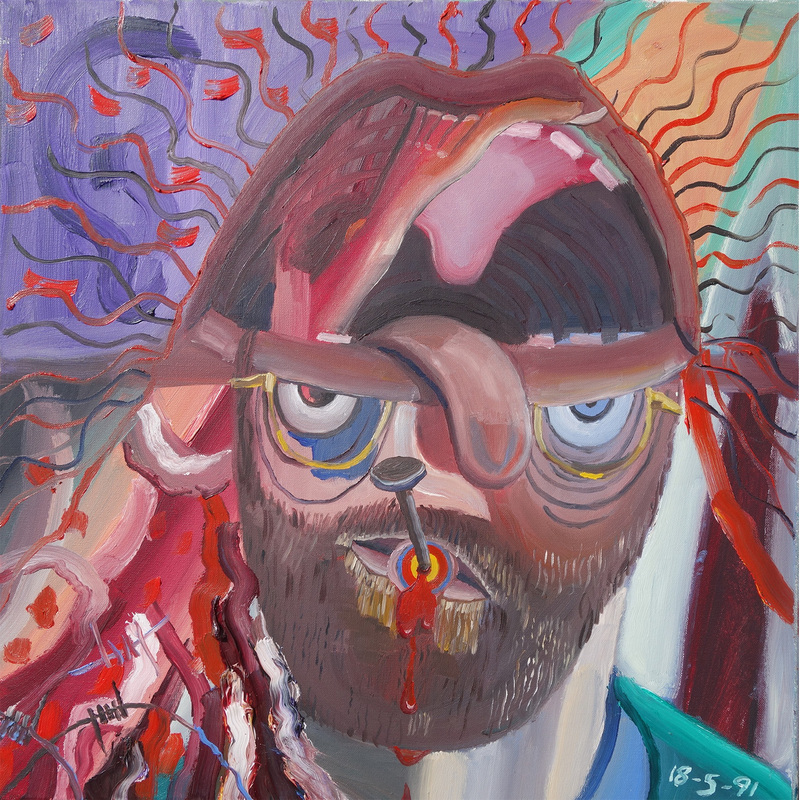 Each painting was created as an experiment to come “face-to-face” with his illness. I felt it would be appropriate to use them here as they demonstrate, far better than can be done with words, what schizophrenic symptoms can feel like. Psychiatrist Eugen Bleuler first coined the term ‘schizophrenia’, originating from the Greek “schizo” meaning to tear or split, and “phren” meaning intellect. This could explain the common contemporary myth about the illness involving a split personality. In reality, schizophrenia comprises a range of distressing symptoms including delusions, hallucinations, incoherent thoughts and speech, catatonic behaviour, affective flattening, alogia and avolition. The varied nature of the illness makes it challenging to diagnose using a single modality. However, it is one of the most debilitating of mental illnesses, with more than 24 million sufferers worldwide, which compels scientists in a variety of fields to continue in their search. Psychological and biological accounts present quite distinct determinist perspectives, unless combined within the ‘diathesis-stress’ model – a more holistic explanation that is now the leading approach in providing aetiology for the illness. A genetic susceptibility for psychotic symptoms is problematic to trace back to a particular genetic locus or even a small amount of genes. Therefore, a range of methods provide evidence for the involvement of numerous specific genes and rare mutations within them. Findings strongly indicate a heritable aspect to the disease, such as the fact that those with a first-degree relative with schizophrenia are ten times more likely to develop symptoms than those without. Moreover, twin studies reveal an overall heritability estimate of 80%. These discoveries highlight schizophrenia to be one of the most heritable of mental disorders. However, it can be difficult for researchers to discriminate between findings that are due to one’s environment as opposed to genetic makeup. To overcome this issue, adoption studies have been conducted using adoptees with and without schizophrenic family members. One early study found that 16.6% of adopted children with schizophrenic mothers developed the illness while none did within the control group. These findings were supported by a more recent study, where adopted children with psychotic symptoms had a 21.4% chance of having biological relatives with schizophrenia, compared to 5.4% in those who did not. The leading biochemical theory of schizophrenia is the dopamine hypothesis, which maintains that symptoms like hallucinations, thought disorder and behavioural problems are significantly correlated to excess activity of the neurotransmitter dopamine. Antipsychotic drugs such as phenothiazines act on symptoms of psychosis by blocking the brain’s dopamine receptor sites, lowering dopamine activity. While these drugs attenuate many symptoms of schizophrenia, they have side effects such as tremors similar to those shown in Parkinson’s Disease, which is known to be caused in part by low dopamine levels. This effect is interestingly reversed when Parkinson’s patients are administered L-dopa – a drug that raises dopamine levels – resulting in the display of psychotic symptoms. Post-mortem studies have also revealed increased levels of dopamine and a considerably greater number of dopamine receptors in the brains of deceased schizophrenia patients. Cognitive theories of schizophrenia centre on attributional and interpretational biases regarding anomalous experiences. For instance, auditory hallucinations are typically experienced by around 10 to 15% of healthy individuals, but may be interpreted in a way that makes them believe they are becoming insane, or that they ought to listen to and adhere to what the voices say in order to avoid negative consequences. Such biases are associated with deficits in cognitive functioning, again linked to excess dopamine activity, resulting in a slow decline in abilities such as early stages of sensory information processing. As a result, some sufferers experience affective flattening – a symptom rendering them socially isolated with a lack of emotions – meaning schizophrenic patients who have developed paranoid beliefs are not in the presence of others who can disconfirm their ideas, leading to a spiralling self-fulfilling prophecy. The double-bind hypothesis suggests that schizophrenic symptoms result from a pattern of contradictory, hostile and blameful treatment from family members. For instance, families with high expressed emotion (EE) tend to place blame on the sufferer for their circumstances, and express this through shouting rather than talking through. Prior to these findings, it was advised that schizophrenic patients should go home to their families from their institution, however it has now been established that the median relapse rate in a high-EE environment is 48% compared to 21% in a low-EE environment, and that interventions to control EE in families is a more effective approach to improving symptoms. This assumption is associated with the diathesis-stress hypothesis, which intends to merge biological and psychological approaches. For instance, an individual who is genetically liable to schizophrenia may not develop symptoms of psychosis until they encounter certain life stressors that can transpire during early development, in dysfunctional family relationships or in adolescence. The above approaches are similar in their use of empirical methods, problems with defining cause and effect and investigation into family influences. They also coincide in their discussion of the influence of dopamine, which in turn affects cognitions and the attribution of symptoms to external factors. However, they differ in that the biological approach looks at inherent traits such as genetics and biochemical composition and uses pharmacological treatments, whereas the psychological approach focuses on upbringing and cognitive processes, and family therapeutic or cognitive behavioural treatments. Overall, they work in harmony within the diathesis-stress approach, which claims a genetic predisposition to schizophrenia will only result in symptoms when activated by life stressors. Thank you very much 🙂 I so appreciate it! I completely agree, many medical professionals do not understand schizophrenia, which is why we must use a holistic approach. It cannot be understood purely in terms of biology or psychology. It can be very harrowing to hear/read about it, but it’s all the more reason why we should, in order to understand it from a multitude of perspectives. Thank you once again for commenting! So enlightening. Thank you for this. Very informative and excellent post! Thank you for sharing. Thank you. I really appreciate it! I’m glad you could gain something from it. Great piece! You did a great job laying out the different perspectives and approaches to schizophrenia. With regard to mental illness, most of the time, myths reign supreme over facts in the minds of the general public. Of all the theories espoused here, I am leaning towards the double-bind hypothesis. My training is in psychology and Sociology so I am always interested in the external circumstances and how they shape a person’s psyche. We live in an age where pharmaceutical companies are interested in profit, so I fear that the double-bind hypothesis will be subordinated to the more biological ones. In America, black people are overrepresened when diagnosed with schizophrenia. What is your opinion on this? Thank you so much for reading and for commenting. I absolutely agree there is not enough talk about mental illness, and when it is talked about, there are many myths involved. I personally would agree with you on the double-bind hypothesis. It’s a theory that’s a lot more prominent nowadays, but you’re right – it’s a lot cheaper and more profitable for health services to just focus on biological factors and treatments! Wow. That surprises me because I wasn’t aware of it, I’m not living in America so haven’t really come across that before. On the other hand, it doesn’t surprise me at all. There are many racial biases involved in all aspects of society. Presumably, this particular one might have come about due to differential treatment and available healthcare services, and education. Or perhaps there is more of a stigma in black communities surrounding mental health, so they don’t get help when they need it. What is your opinion? From what I have read, schizophrenia was primarily a white woman’s disease until the 1960s. At this point, the civil rights era began – with black men on the forefront fighting for basic freedoms. We then started to see black men being diagnosed with schizophrenia at higher rates, and it is still the case today. Thus, the diagnosis is subjective in some respects and is being used to contain the specter of black freedom by categorizing their legitimate perspectives as a mental illness. Wow.. great post, though I must confess that a lot of it went over my head. Could you explain the “diathesis-stress approach” in laymans terms? I would like to learn more about the biological vs psychological theories for schizophrenia.. as although I have had the disease for 12 years, I never quite got round to researching more about it on these levels. I have to say though, the reconfirmation that the doctors are still getting to grips with it gives me hope- because I feel very strongly that medical/biological/psychological theories are still only one part of the whole experience.. the reality of going through it has always seemed like something more to me. Thanks for your comment! Of course – the diathesis-stress approach suggests that you can be genetically likely to have schizophrenia, but won’t necessarily develop it unless you experience stressful life events that ‘bring out’ the symptoms. I hope this makes more sense! It’s important to learn from biological and psychological perspectives, but it’s also essential that we learn about it from a personal one. By going through it yourself and telling others how it feels, you are enlightening them more than biological jargon ever could. So thank you, Alex! Very well written! I recently did a paper where they were using dreams as a model of psychosis since that is the closest we get to internally creating a reality without having psychosis. And by internally creating a reality, I mean that in that moment, it is real for us and is generated within us. And how we can learn to control our dreams (lucid dreaming), we might be able to get a better idea as to how to produce insight and get power over hallucinations. I work in the mental health sector and see how debilitating disorder like schizophrenia are due to lack of awareness. Just yesterday, I met a patient who was highly psychotic and the medication had not started working as yet. His family had disowned him and he had been living in different rehabilitation facilities for the past 20 years. Thanks for your comment 🙂 that paper sounds so interesting, could you forward it to me or can I find it somewhere? When you say lack of awareness, do you mean the one suffering from SZ or societal / familial lack of awareness? Thank you. I can send the paper to you, it’s not published as of now. I meant both to be honest. Lack of facilities available (both due to awareness, amenities provided or known to be provided, cost, everything), lack of understanding of what the individual might be going through, familial caregiving burden. There is such a big tabboo on words related to mental health. Most people prefer to deny any existence of such issues and just abandon such an individual. It’s really sad. I won’t say it’s all negative. Things are gradually turning around. So much work left to be done. Interesting to read – but am always hopeful attitudes to Schizophrenia and other mental health issues are like a wall where brick by brick attitudes from the past are falling down revealing new ways to help people get well – not solely relying on what has gone before. Think healthy eating and healthy gut have a significant role and also exercise. As a new professional hope you will be part of a sea change in existing attitudes! Watching my son try and cope with time spent in mental health hospitals – i am pleased care has moved into the community but without funding, who knows how this will work.pr what effect Brexit and loosing people happy to work in this area as mental health nurses.